Potty training a special needs child involves special considerations not always warranted with other children: more patience, more perseverance, and more flexibility are required. Still, when those special needs involve autism, kids are like snowflakes: no two cases are the same. Autism is a spectrum rather than a diagnosis that involves frank and universal symptoms. Some autistic children take to the toilet as though the flush is fabulous, while others want nothing to do with ditching their diapers. In general, it’s recommended that the average child begin toilet training around the age of three. For special needs children, this number is irrelevant: it’s not about when is right for everyone else; it’s about when is right for them. Besides, not all children – autistic or otherwise – abide by the three-year rule. Kids are born dictators, believing from birth that they’re in charge and many potty train on their own terms and not on the terms of a peon (i.e., you). One thing worth noting, however, is other types of timing are important for autistic children. Never begin potty training when your child is undergoing any transitions. If they’re starting a new school or getting a new babysitter or a new sibling, wait until they’ve adapted before you move onto the next evolution. Your child will demonstrate that they’re ready to be potty trained (including in cases where they’re nonverbal). 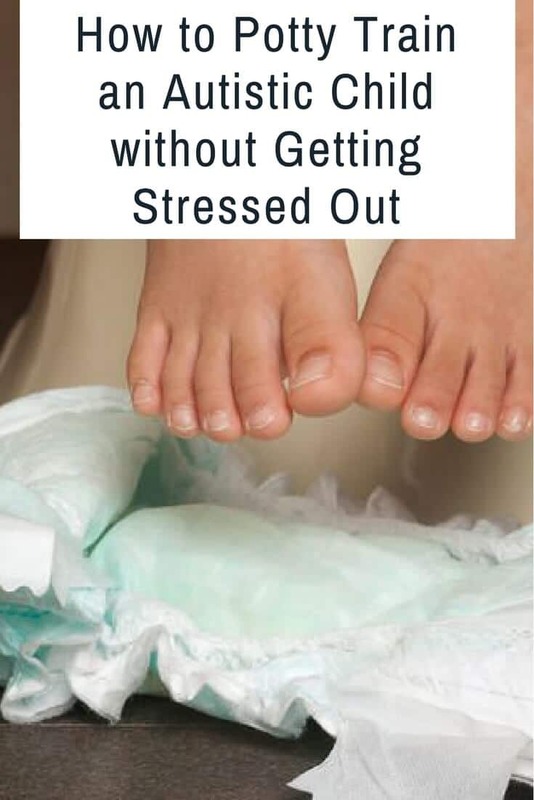 Some of these signs include showing you that they’ve soiled their diaper, being able to follow instructions, having regular bowel movements, and having bladder control (at least adequate control, no one expects a child to hold it for five hours after seven juice boxes). Once your child exhibits readiness, put them in underwear. Yes, it’s messy and expensive, but it helps kids equate soiling themselves with unpleasantness. There’s a reason so many of us utilize baby steps when trying to accomplish a difficult feat – baby steps work. In toilet training, utilize these baby steps by breaking down the process into simple steps. You might start by celebrating your child’s entrance into the bathroom, then celebrating sitting on the potty. Celebrate each milestone, reinforcing the behavior as you go. Once your child has mastered one step, don’t disregard it: keep reinforcing through positivity. Yelling or punishing a child who is attempting to potty train is never the answer! It might seem like a possible choice (given the level of frustration mom and dad face), but punishment leads to regression and eventual disinterest. Do you want to keep your child in diapers forever? Then by all means, shame away. But, if you want to help them learn to go in the potty, don’t overreact to accidents. Use a neutral tone that conveys neither approval nor disgust. Then set them back on the toilet so they know where the poo goes. Social stories are a wonderful ally in potty training an autistic child. These tales of the toilet use simple, clear, effective language and descriptive pictures to demonstrate what is expected of a child in regard to toilet hygiene. The stories are powerful because they help your child develop and understand potty vocabulary, reconcile what they see in the story with what is happening in real life, and know what to expect during the potty training process. The pictures work to provide visual aids (more on that below) and clearly show a child what they need to do with their doo-doo. Many children with autism are visual learners no matter what they’re learning – botany or bowels. Using visual cues like picture cards to demonstrate the step-by-step process helps your child understand the ultimate goal (hence the social stories mentioned above). If you don’t fancy yourself an artist, consider using actual photographs. You can even use your child’s favorite stuffed animal as the model. The camera loves a teddy bear. Though visual aids are important, verbal praise is as well. Tell your child how proud you are of them, reward them with prizes for the desired behavior (reward the smallest successes too), and regale them with tales of stickers and iPads and all the glorious things that await them when they embrace the toilet seat. For autistic kids, it’s vital to deliver rewards and praise immediately after the desired action is accomplished. According to Autism Speaks, any delay, and your child may fail to correlate the prize with the potty. Many autistic children have sensory issues, which can make toilet training more problematic. Keep this in mind! Recognize any sensory triggers your child may have – the scent of the bathroom soap or the sound of the toilet flushing – and work to minimize these. A child may be sensitive to things you don’t even think about, such as the lighting in the bathroom or the coolness of the tile. Make any needed changes before proceeding onward. There’s no way around it: some kids play with their poop – you see bowel movements, they see finger paint. There are several reasons for this behavior. But, fortunately, there are solutions as well. Visit the doctor to make sure there are not any physical factors involved (your child may be doing this as a result of pain). Make sure they understand the process of wiping – you may have to teach them by guiding their hand with yours. Make sure the toilet paper isn’t overly harsh; wet wipes may be a better option. Provide other activities children can embrace (like finger painting or playing with clay). Yes, potty training is redundant: you can only praise the poop for so long before you grow bored. But this repetition is particularly important for potty training autistic children. Routine is vital, so set a schedule for bathroom time. Your child will have to go during other times, of course, but a regular schedule helps them understand the point of the potty (and a regular schedule helps them stay regular too). Experts recommend using one word consistently to discuss the process: a word such as “toilet.” Though there are many euphemisms applicable – john, potty, porcelain throne – using words interchangeably may confuse an autistic child. Using the word ‘’potty” may also cause your child to call the toilet the “potty” forever, even as an adult. Children with limited verbal capabilities face particular challenges in expressing their need to use the toilet. The best thing to do is teach them the simplest ways to signal you (or whomever they are with). You might try another type of visual aid – a picture of the toilet that you clip to their shirt sleeve or belt, for instance. The idea is for your child to point to the picture when their bladder or bowels are full. Each time they cue you successfully, praise them for their good job. Praise the crap out of them…literally. Change your child’s diaper in the bathroom. This helps them recognize the relation between peeing (and pooping) and the toilet. Practice sitting on the potty even if they’re not actually going. Practice breeds familiarity. If your child is particularly averse to change, ditch the potty and go straight to the toilet. This might require a toilet training seat, but it will limit the amount of disruption to your child’s routine. Take your child to the toilet right before they naturally go. You can figure out timing by keeping a record and looking for the pattern. Don’t force your child to stay on the toilet longer than is necessary – too long begins to feel like punishment. Keep your child well hydrated during toilet training. Priming them with juices and water helps them pee, giving them the chance to practice. Stay calm – remember, positivity helps with potty training. Negativity keeps your child in diapers. If your child isn’t making progress, take a break – there’s always a chance you started before they were truly ready. If they’re still not taking to the toilet after you’ve tried and tried again, seek the help of a professional (such as a pediatrician or occupational therapist). Most kids learn how to use the potty during waking hours long before they can control their bladders during slumber. Recognize this and don’t be alarmed if your child continues to wet the bed – the brain to bladder connection takes time to develop (it is this connection that wakes a child from sleep and tells them to go to the potty). Thus, utilize nighttime diapers until your child wakes up morning after morning dry. In the meantime, make sure you use nighttime diapers wisely – it’s highly important to take off the diaper as soon as your child gets up. Failing to do so can invite regression. Autistic children are wonderful gifts who might need a bit more time to grasp the concepts of childhood. Thus, be patient – know that accidents definitely happen and, when they do, brush them off as no big deal. Because everybody poops…and, sometimes, it’s on the floor.